and the first 25 years of national celebration. Exhibition curated by Vanessa King. On view near the Donald W. Fyr Rare Book Room, Level 2. 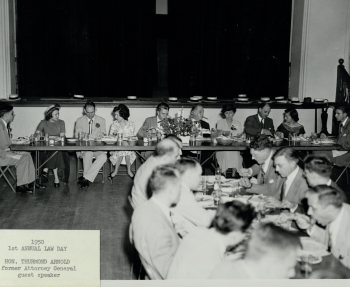 Image on left: The first Law Day gathering for Emory's Lamar School of Law was held May 5, 1950. 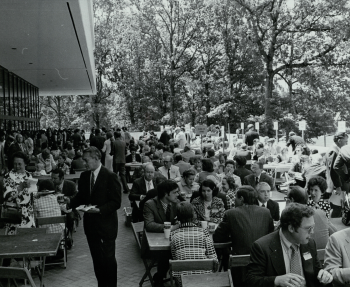 Image on right: The first Law Day in Gambrell Hall was held May 4-5, 1973. 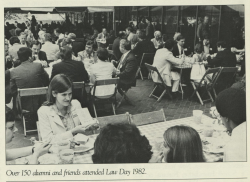 This exhibit from the Emory Law Archives offers a glimpse into the history of the Law Day celebration at Emory Law School. Emory Law Day began in 1950 as a spring semester tradition and evolved to feature class reunions, the finals of the Moot Court Competition, an inspiring and challenging keynote speaker, presentation of awards, and of course the chance for alumni, faculty, staff, students and their families to renew old friendships and begin new friendships over a barbeque luncheon and the many planned activities. But above all, the celebration has always been a time to have fun and honor each other and our legal tradition.